In the northern Palestinian village of Aboud on a cold December afternoon, I join villagers who huddle in the small stone church of the Virgin Mary, called al-Aboudiya by locals, and listen. 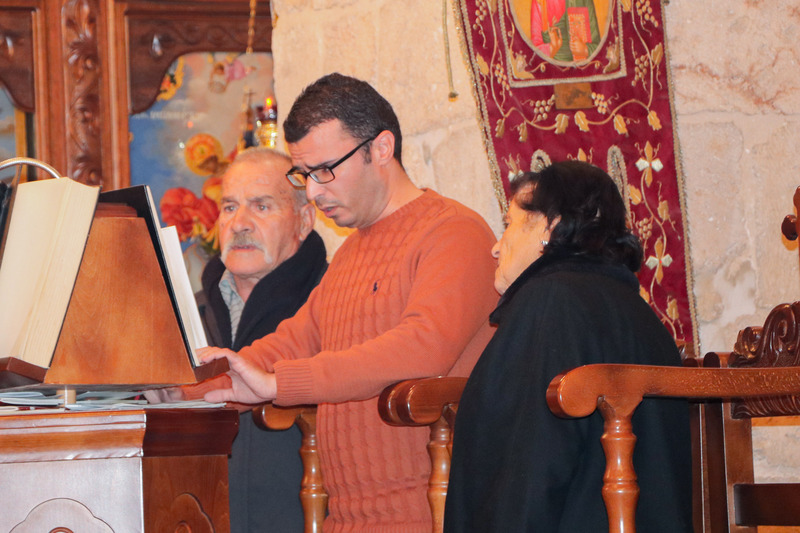 A man and an elderly woman are singing prayers in Arabic in honor of St. Barbara, whose feast day made this remote village of lemon and olive trees famous throughout the region. 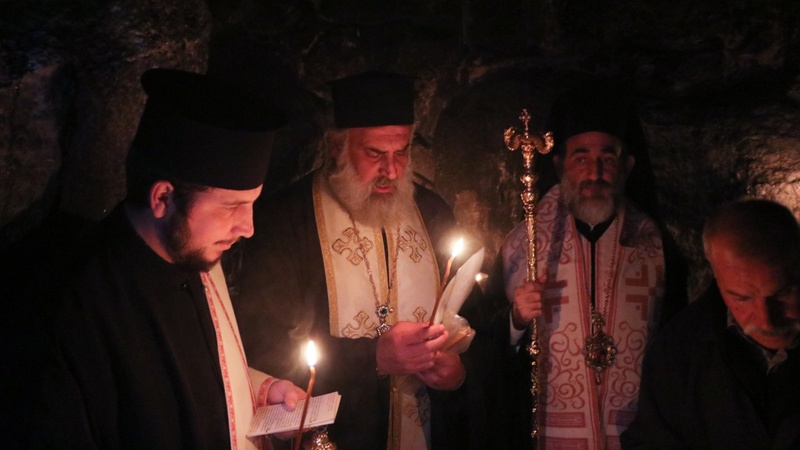 Soon, we will gather and journey to a tiny hilltop shrine to light candles in the cave where locals believe Barbara hid from her father more than 1500 years ago— a tradition they have maintained here since early Christianity. Walls across from the church of Aboudiya – by Stephanie Saldaña. Celebrated throughout the Middle East on December 4, but on December 17th in Aboud due to the Julian calendar, the Feast of St. Barbara is one of the most important Christian Feasts in the Middle East, particularly in Aleppo and Aboud. In Lebanon locals dress up in costume, in Aleppo they sing or act out the legend of Barbara’s life. In Bethlehem, local Christians plant wheat seeds that they allow to grow until Christmas day, which they then use to decorate the nativity scene beneath the Christmas tree. In nearly all places, they eat a sweet dessert symbolic of Barbara’s perilous journey escaping her father and the Roman authorities. A local boy serves burburah, the traditional food of St. Barbara’s Day – by Stephanie Saldaña. In Palestine, the Feast of St. Barbara is the beginning of the Christmas season, and marks the onset of a trilogy of local feasts—St. Barbara on the 17th of December (in Aboud), St.Saba on the 18th (at Mar Saba outside of Bethlehem), and St. Nicholas on the 19th (in Beit Jala)—that prepare local Christians for the coming Christmas in Bethlehem. According to legend, St. Barbara was born in Heliopolis, or modern day Baalbek in Lebanon in the 3rd or 4th century, though some accounts also have her born in Egypt, Turkey, or Palestine. A beautiful young girl, she was locked in a tower with only two windows by her jealous father, who was a pagan—an ancient version of the Rapunzel story. In some versions, she was converted to Christianity by a priest disguised as a merchant who traveled through the town, after which she built a third window in her tower to symbolize the trinity. Others claim she fell in love with a young Christian. In all accounts, she tells her father of her new faith. He becomes so furious that he threatens to kill her, causing her to escape from the tower and flee for her life. Today, the villagers of Aboud recount the story that Barbara ran from her father on an ancient Roman road that traversed their village—the same road by which they believe that Jesus himself brought Christianity here on his journeys from the Galilee. On the way, Barbara put on various disguises to evade the Roman authorities. Once, when she ran through a field of wheat, it miraculously grew around her to conceal her. She then hid in a local cave, before she was eventually imprisoned and killed by her father. Later, he was struck by lightning and died immediately. Today, St. Barbara has a curious legacy throughout the world: in France her father’s death by lightning has made her the patron saint of miners and artillery men. Another European tradition has her caring for a cherry branch in captivity that then blossomed when she died—leading people today to buy cherry plants on her Feast Day, hoping that they blossom for Christmas. In Aboud, the locals still come out every year to remember her life. 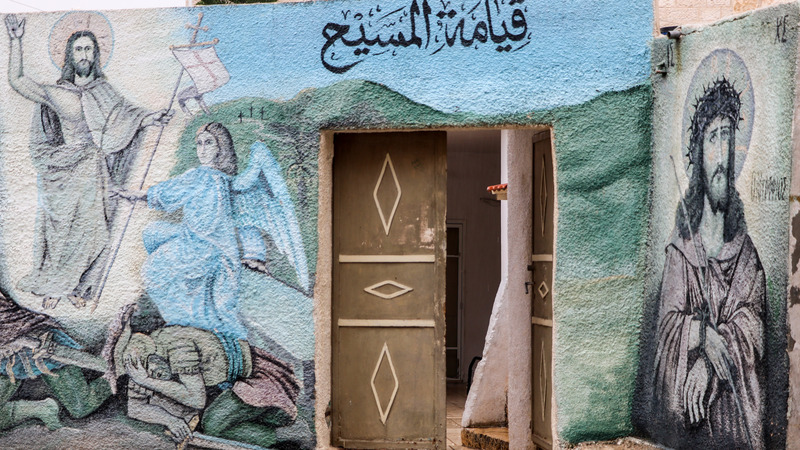 Aboud means “to worship” in Arabic, and though this shared village of Muslims and Christians has one of the most ancient Christian communities in Palestine and has the ruins of seven churches, today only two remain. A Byzantine church built in her honor was destroyed by Israeli forces during the Second Intifada in 2002. After prayer, I journey with the villagers to a mountain shrine west of the village, dramatically set against olive trees. A tiny cave with barely enough room to fit a few people lighting candles is all that remains of the place where Barbara once hid. Mothers and fathers hold their children’s hands and guide them inside to leave candles on the stones. While once hundreds would attend this Feast, today there are only about twenty people. 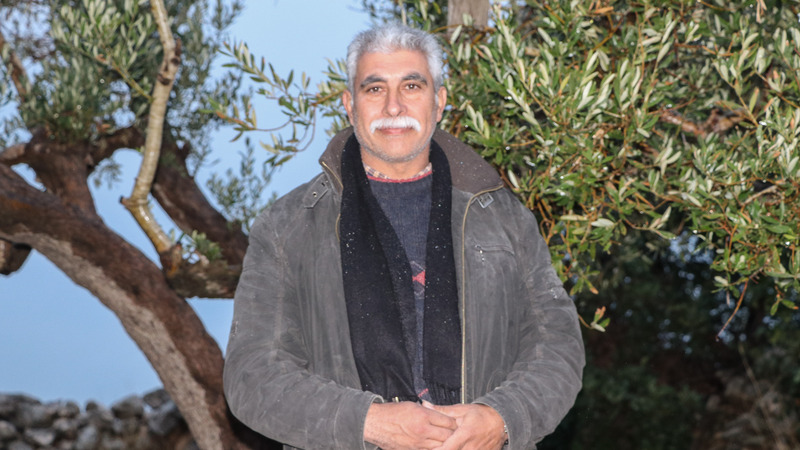 Yacoub Zarour, who has lived in the village his entire life, points to a flat space visible beneath us that used to be a large cistern: “Barbara’s father was struck by lightning there,” he insists. The space was covered over when a local child drowned inside, and is now a picnic area. A small grave on the nearby hillside is where he believes Barbara was originally buried. Yacoub Zarour has been attending this feast all his life – by Stephanie Saldaña. 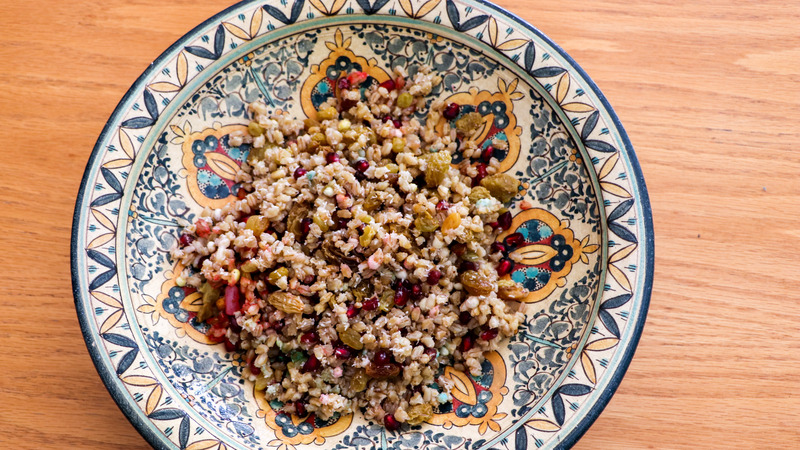 When we finish, we return to the village below for a gathering to eat burburah-— the traditional dessert of St. Barbara’s Day, a dish of cooked wheat with spices and covered with fruits, nuts, pomegranate seeds and cinnamon. 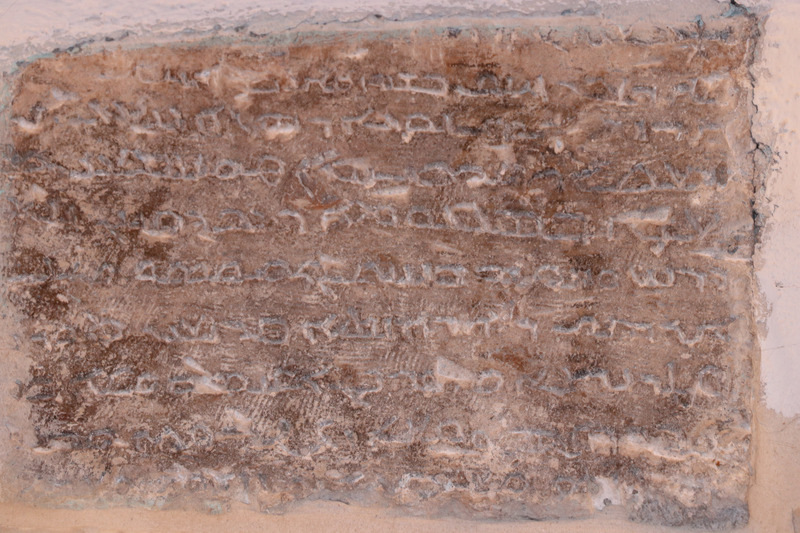 The wheat commemorates the sheaves that rose up to hide Barbara when she fled. 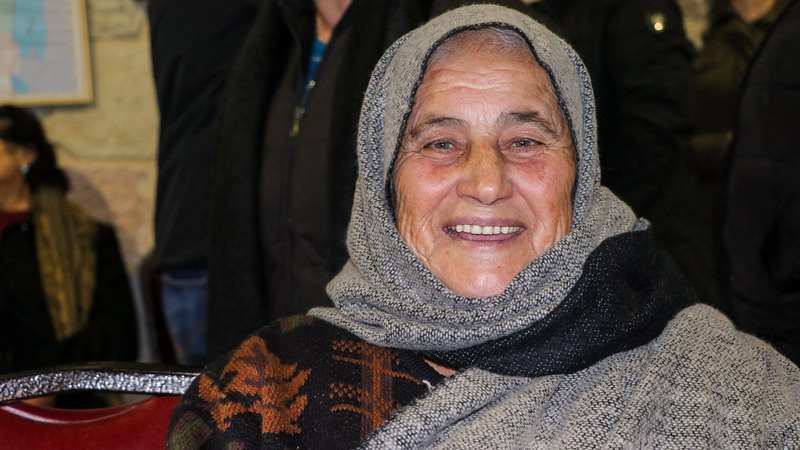 Wadiah, who is seventy-seven years old, remembers celebrating the Feast of St. Barbara’s in her childhood. Then, she said, the prayer was not in the church but in every single home. The burburah was cooked in an enormous tanjara, or pot, and was fed not only to the children but also to the chickens and cows. “We had to,” she insisted. “The wheat was blessed.” In those days they grew their own wheat around Aboud—perhaps a clue as to why Barbara’s story of the wheat became associated with the village. She still has an old grain sieve hanging on the wall of her house. She shakes her head. “We no longer have wheat here,” she says. With the mass migration of Christians from many countries in the Middle East, the Feast of St. Barbara is quickly becoming endangered. In Bethlehem, Jerusalem, and Aboud, locals are trying to keep the tradition alive—particularly through food. Judy George Abdallah, from the old city of Jerusalem, told me that when she was growing up, they created the tradition that every single person in the family had to make burburah in turn, so that they would all have to learn the method of making the dish. “I learned from my grandmother, and every year we all came together to eat burburah,” she said. “It must be the entire family together. My grandmother passed it to my mother, who passed it to me, and now I must pass it on to my own children. It’s our tradition, and it must pass from one generation to the next.” It is a common for Christians to share burburah with their Muslim neighbors, the dessert a way of celebrating heritage together. Judy George Abdallah’s version of burburah – by Stephanie Saldaña. Fr. Elias*, a priest from Aleppo, remembers that St. Barbara’s was famous in his city during his childhood. “All of the children would dress up like a carnival,” he said, “and we would sing songs about St.Barbara. As a child I would think about it for days: what I was going to wear, about the delicious food. 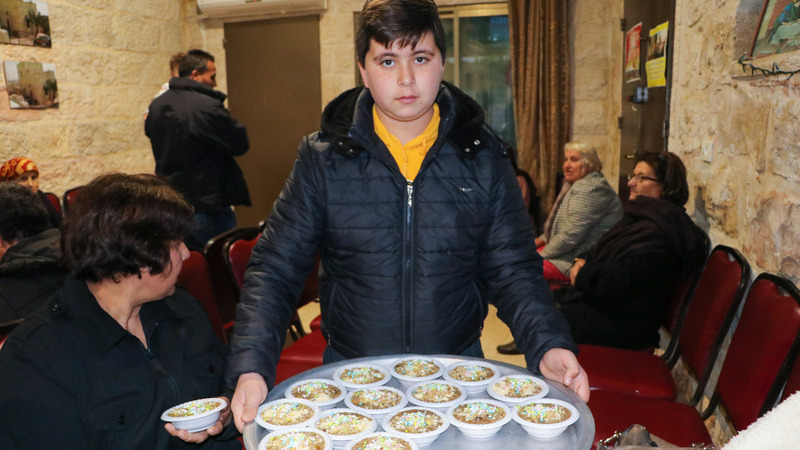 I was inspired by Barbara’s story, about how she suffered and yet continued to keep her faith.” In addition to burburah, Christians in Aleppo would eat a dish called Qash al-Barbara, fried shredded pastry covered in sugar syrup and topped with cinnamon, cloves, rose water and nuts.